One of the things that really helped me learn more about beer and beer styles was being member of a “beer of the month” club. Two friends and I signed up for such a club back in 2000 (it was originally a Michael Jackson club, and was later purchased by C&H Clubs Inc.) and we’ve been members ever since. I’ll never forget our first shipment. It was a beer that, at the time, I had never heard of – Olde Suffolk by the Greene King Brewery in Bury St. Edmunds in England. This beer blew me away. It is Old Ale made by blending a two-year-old oak aged beer called Old 5X and their Best Pale Ale (BPA). Though once common, the practice of blending is now very rare in England. (But still widely practiced in Belgium.) Olde Suffolk is a very complex dark ale, providing a slight oaky tartness along with earthy hops, a sold malt body, hints of dark sugars, and a mineraly English finish. Needless to say I was sold on the club after this first shipment. Not all of the selections have been as good as the first (that would be an impossible task), but their selections seldom disappoint. Joining as a team like my friends and I did helps us keep the cost down while still getting to sample new, usually difficult or impossible to find, beers each month. Initially we were subscribed in the International category, where we received two six-packs of two different beers each month. So we each got four beers – two each of two different types. Recently we switched to the International & Domestic category where we each get four different beers – two of which are domestic and two that are International. It doesn’t sounds like much, but our club allows us to order more of any particular beer, so if we find a special gem in our monthly selection there is a way to get more. Anyway, the point is, there are different categories and options to suit different beer drinker tastes. I love variety, so this club has been perfect for me. Not only do we get four different types of beers each month, but also they are often styles that may be something we would pass up at the liquor store. So we’re “forced” at times to try something we normally would not think of. Obviously some offerings are better than others, but I’ve never been disappointed, even on the styles I would have never though of buying on my own. And each shipment comes with history about the style and the brewery, as well as tasting notes and suggestions for things like serving temperature, serving glass and food pairings. So it is truly a learning experience that really helps develop beer knowledge as well as a better understanding of history and geography. Our club costs $43/month, or about $14 per person. I handle the payment, delivery and distribution. My counterparts direct deposit their payment into my bank account each month so we don’t have to worry about much about exchanging money. So we enjoy teaming up. With that said, most probably join alone. No problem with that either - more beer for them! If you want to sample unique specialties every month and learn more about beer in general, I highly recommend such a club. (I’m a long time member that has enjoyed it so much I joined a second club of theirs called the Rare Beer Club. 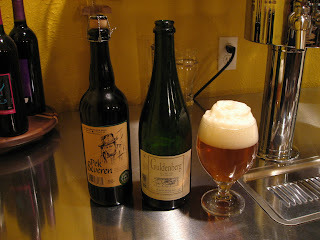 It is similar except I receive two rare specialties, usually strong beers packaged in cork finished champagne bottles.) If you’re not sure how well you’ll like such a club, start off with a three-month subscription and try it out. You may end up like me and still be a member nine years later. Since Christmas is right around the corner, it also makes a great gift for any hard-to-shop-for beer lover. For more information about C&H’s Beer of the Month club visit their web site at http://www.beermonthclub.com/join-gift.htm. I’m not advocating any particular club; these guys are just the ones I’m familiar with. If you have other recommendations, please drop a comment.